When the armistice was signed, on November 30, 1918, Mosul and its surroundings was under the control of Turkish forces commanded by Ali İhsan Pasha. The British demanded the evacuation of the town. 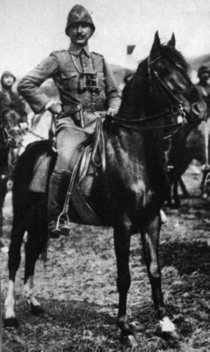 Ali İhsan Pasha refused, but when the Turkish High Commanded ordered him to do so, he had no option but to withdraw from Iraq. Ali İhsan Pasha was arrested upon his arrival in Istanbul and sent to exile in Malta. When he was released in September 1921, he joined the national resistance and took over the command of the First Army in the War of Liberation. The next year, due to his personal conflicts with İsmet Pasha, he resigned. In 1944, he was arrested because of his anonymous letters criticising President İsmet İnönü (İsmet Paşa) and sentenced to 15 months in prison. In 1954, he was elected to the Parliament from the Democrat Party. Ali İhsan Pasha died in 1957.